Yep. Dirty little mice. I assume they're dirty anyway. What else would they be? They are running around on MY floors after all. We used to have mice when we first moved in here, 8 years ago, but after putting out some poison they magically disappeared, and we haven't seen them again until now. Now, we Definitely have mice again. Sometimes at night when I am sitting at my desk I can hear them scratch, scratching in the closet next to me. Or scratch, scratching somewhere in the living room while I am watching TV. Whenever I hear them I just start yelling and stomping on the floor. Cuz if I were their size that would scare the crap out of me. But they just keep getting bolder and bolder. The other night while playing on the X-Box I distinctly heard a "Squeak! Squeak! Squeak!" go running across the room behind me. I mean! The nerve! If I were living in a Giant's house, eating their food, trying to stay alive, I would try my hardest NOT to run screaming through a room that they were in. Maybe he did it on a dare? Maybe it was some sort initiation into a mousy fraternity or something. That probably IS what is actually going on, cuz the next night I actually SAW the mouse running to hide out under my entertainment center. Which was the last straw. I can pretend they aren't there if I only hear them once in a while, but now I don't really have a choice! 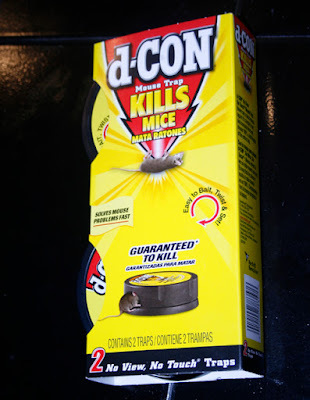 I went out and bought some mouse traps, which claim to get rid of mice FAST, and do it without me having to even see the mouse once it is caught. Only once I got them home I realized they don't come with any bait. I thought they'd be like Ant traps, all souped up and ready to go, but NO. WE have to bait them OURSELVES. And so, tonight, the traps are set, baited with a variety of cheese, peanut butter, and even a gold fish cracker. Let's see which works best? You're Going Down Little Mousy! Not even one. The mice didn't fall for it. All my spiffy new traps are sitting alone and impotent. I really kind of expected them to each have a mice inside and my problems would be over. But clearly not. And to make matters worse, this morning some cheeky mouse went running ACROSS MY KITCHEN FLOOR! In the full light of day! In view of me and both my children! So now I am just mad. AT LEAST COWER BEFORE ME, TINY MOUSE! I AM HUGE! Fae doesn't want you near her blouse! A way to pass me filled your thoughts! Oh where's the broom! Hey look! It's here! and then you knew the end was near. The curtains closing, things looked bleak. Your chances slim, your position weak. maybe you could skip your doom. I'll whack you hard right on your brain! And I will, Little Mouse. I WILL.